MINI Cooper Acccessories + MINI Cooper Parts :: OutMotoring.com MINI Blog :: OutMotoring News :: Have you checked your MINI brakes lately? Keeping You and Your MINI on the Road With Proper Brake Pad and Rotor Maintenance. You simply won’t live very long if you drive your car without functioning brakes. OutMotoring wants you to be alive; very alive. Lots of other people want you alive too. Brakes are hyper critical to keeping you safe as you drive. Having good properly inflated tires, a clear windshield, and a good dose of common sense can help too, but brakes are simply something you cannot afford to neglect. As brakes wear they continue to do their job. This is unlike tires which slowly get hard, lose traction, swell, crack and begin to function poorly. You as a driver will likely NOT notice this slow wearing of the brake components because they still function as they should until something fails. They stop working when a brake pad wears through to the backing plate, a brake rotor wears through to the venting, a brake line leaks, a master cylinder fails, or a brake caliper seizes or wears out. Even though modern Automatic Braking systems are rather complex the general concept of how they work is basic. Here’s how they work. You (or in this case your foot) press on a lever. That lever is attached to a special valve (called a master cylinder) that amplifies and distributes that force in a certain percentage between the front and rear brakes. Brake fluid contained within small diameter metal pipes and hoses is pushed through special valves, chambers, lines, and then into piston chambers of brake calipers located at each wheel. This turns the pressure placed on the brake pedal into a pressure that eventually presses brake pads directly onto the brake rotors (the round metal parts you can see through the wheel) which then reduce the speed of the car. Wow, that is actually quite complex! While the braking system is more complicated than described, especially with modern computer controlled systems that integrate traction loss, weight shift, speed, and many other variables, understanding this will get you through a basic conversation with a technician or service writer at your local shop or as you navigate shopping for parts at your favorite MINI parts retailer. So, What Do I Need To Be Aware Of? The stunning, and massive, red John Cooper Works Big Brake Kit Calipers shown peeking through the spokes of a wheel. In the background are the giant JCW Cross Drilled brake rotors. Hidden from view at this angle are the brake pads. Your MINI may not have these flashy red calipers or cross drilled rotors but maybe someday it will! The 2 main braking system components that need to be serviced and replaced are brake pads and brake rotors. Generally brake pads last 35-50,000 miles under normal circumstances. Brake rotors typically last 40-90,000 miles, again depending on driving conditions, terrain, driver awareness, braking compound, weight of the car, and many other variables. Usually a driver can get 2 sets of brake pads replaced before needing to replace the rotors (the large round flat objects behind each wheel) when going to the 3rd set of brake pads. This should be carefully reviewed with your mechanic as brake rotors have very specific thickness ratings and if you wear beyond that minimum thickness bad things happen. You may need to replace rotors more often or within fewer miles than our general range noted, but in general they last twice as long as brake pads. Front and rear brake pads wear at different rates, depending on many variables such as the ratio of the front to rear bias in the Master Cylinder (the first main valve that controls braking distribution). Generally cars have a 60/40 ratio or even higher depending on weight, size, and type of car. You may be surprised, as I once was, to find that the REAR brake pads in my 2003 MINI had worn out at close to 25,000 miles while the fronts lasted nearly 45,000 miles. Others find the opposite but strange things can happen depending on driving variables. So, while this variable life-span range can be a bit confusing, the best thing to do is to look between the spokes of the wheel at a angle and shine a light at the brake caliper and notice the thickness of the brake pad material. At some point your brake pads and rotors WILL need to be replaced. A cropped image of a rotor (flat round metal part), brake pad, brake pad backing plate, and brake caliper (the part that clamps the brake pads). If the brake pad material is less than ?” you need to be cautious as you plan the next 6 months of your ‘driving’ life and budget accordingly. Fresh brake pads are close to 1/2” thick. Check out the pic above. If you have significant grooves in the face of the rotor that you can feel with your finger or actually see you likely have brake pad problems or at some point the pads have created uneven wear patterns on the rotors. A quick visual inspection is the best way to monitor your brakes. Consider doing it once a month as you fill up gas in the tank. New brake pads are generally ½” thick. If your brake pads are less than ?” start planning for replacement. What’s Going on With my MINI? It Shudders When I Brake! If you feel this shudder in the steering wheel when braking it is typically due to a warped front brake rotor (or both) but can also be due to worn tie rods, ball joints or other components. It is always best to consult a mechanic to confirm. If it is the brake rotors it’s a easy fix. When metal rotors get heated up and cooled too fast they can warp. This can happen as a driver cruises down a steep hill and rides the brake pedal or is constantly pushing the brake pedal, speeding up and doing it again, and again, and again. Driving in busy traffic with bursts of speed over and over again can also do this as would driving through a puddle after using the brakes a LOT. There are other causes for warping (such as over tightening wheel bolts) but a shudder is the most common. If you feel a similar shudder in the seat or floor area it is generally related to a warped rear brake rotor issue. Simply replace the warped rotors with new rotors as soon as possible. Many years ago it was common to the take the rotor off the car and use a metal lathe to cut the warped material off .01 of inch at a time until the surface was flat again, after which they were put back on the car AFTER confirming the minimum thickness had not been breached. This practice is a dying art as shops rarely have the time (nor does the customer want to pay for the labor) to “turn a rotor”. It is often much cheaper and faster to just buy new rotors and recycle the old. Worn vs new brake rotors. Image on the left shows the internal venting exposed due to excessive wear of the rotor surface. So, that’s that. You need to replace warped or worn rotors as part of car ownership. If you own your car for more than 1-2 sets of brake pads you’re likely going to need to replace all or at least a set of rotors at some point. What do you do? Each rotor has a ‘minimum thickness’. Have your mechanic check yours before replacing. Have your mechanic check the thickness of the brake rotors to confirm they are within spec and estimate future wear as you replace brake pads at the same time to confirm the rotors will last ‘another round’. My Rotors are Rusty. I Must Need New Rotors, Right? Wrong. While rust is a an unwanted thing it is a reality of life as we drive cars made substantially of steel. And brake rotors are generally made of steel. Steel, when not treated or painted will rust. The flat part of the rotor where the brake pad makes contact can never be treated to not rust but the raised area where the back of the wheel butts up, called the ‘hat’, can be painted or treated to keep it from rusting. Don’t be concerned if after washing your car you find your rotors are rusty. Simply grab your keys and take your MINI for a ride. A quick stomp on the brake pedal while your car is moving will fix that right up! Rust spots on a steel rotor is common and unless excessive is normal. Blinky, blinky. Warning! Brake Pad Symbol. WHAT? The next level of warning will be dash lights that alert you that something needs attention. Be on the lookout for brake related signs, symbols, warnings or words that may pop up on the dash. These are important to be aware of and understand so you can react accordingly. To make matters a bit confusing some car manufacturers pre program into the dash warning system when they estimate the brake pads or other components may fail. This is based on preliminary estimates based on miles driven and average speeds, etc of your car. Remember though that some people drive 2,000 miles a month on the freeway and others drive 2,000 miles a month in stop and go traffic around town. Some drivers hammer on their brakes at the last second and others coast to a stop with gentle pressure on the brakes. These estimates are bound to be incorrect. Each model has different symbols and warnings for estimated vs actual brake wear status. Check your manual to confirm. This estimated brake life warning signal may display on the dash whether the brake pads are actually worn or not. This ‘warning’ is somewhere between ‘very nice of them’ to ‘ridiculous’ as it makes the car owner think they have a critical problem and they go to the dealer right away and then the dealer/repair shop promptly replaces the brake pads and rotors and charges you somewhere around $1,200. If the actual thickness of the brake pads and rotors had been tested and measured you may have been able to get another 20-30,000 miles (1-2 years!!) out of your ‘old worn out’ brakes! One thing most customers do not know is that if that little brake wear sensor is NOT tripped it can be reused when the new pads are installed, as long as it/they are in good condition. MINIs have a single rear brake wear sensor and a front wear sensor on the right side. Front and rear sensors are different lengths and are model specific so be sure to order the right sensors. Also, the brake light warning on the dash will not automatically go away once replaced. You or your mechanic will need to get into the service mode settings (very easy -- check YouTube) to reset the warnings -- ONLY after the worn brake components have been replaced. You will need to know the difference between the actual warnings on your dash to understand which is which. Please refer to your owner’s manual to distinguish between the various warnings, icons, and lights. Detailed info related to brake wear sensors. How Dare You Reuse Brake Rotors? Some well-versed car owners and mechanics will say to never reuse a brake rotor when replacing brake pads. While there is some understandable reasoning to that it is generally ok as long as the rotors are within spec, and the same type of brake brake pad is re installed. This can be a slippery slope of confusion as there are lots of opinions out there. Some will say to never switch to a new brand or brake compound (the material the brake pad is made of) and keep the same old rotors. Logic would lean towards the thinking that if the brake pad and rotor surfaces were somehow ‘married’ to each other that after a few miles of use both would have worn off that very thin layer or their ‘relationship’ (shallow love affair I guess). I tend to agree with that logic, however others vehemently disagree. As long as that ‘new relationship’ process happens fairly quickly I can’t think of why this would be a long term issue. Front vs Rear or Both? Have it Your Way. Thank you Burger King. Another thing to consider is the fact that the front and rear pads wear at different rates and you could be replacing both the front and rear brakes when in fact only one or the other actually needed to be replaced. Most service writers will say you need new “BRAKES” which they cluster as front and rear regardless of the actual wear of either. Asking these questions often results in a change in your work ticket. Your bill could be half or less of what it could have been without asking these key questions. A educated customer is typically going to spend less on unneeded or premature repairs. Some may say “I just want to be done thinking about brakes and want it ALL done at the same time so I don’t have to do the other brakes in 6 months or 1 year...or whatever the estimated actual end of life of the pads or rotors is”. That’s fine, but you’ll be paying to replace things that you could have safely put off for tens of thousands of miles of driving. Doing a visual inspection to measure the actual thickness of the brake pad material is a great way to stay on top of service costs while maximizing product life. If you simply don’t do this you will likely get 1 of 2 dash warnings at some point, one would be the ‘estimated’ service interval or the actual ‘your brake pads have worn through completely’ warning; this is tripped by the physical brake wear sensor when the brake pads are nearly gone. The most critical warning is generated when a small component called a brake wear sensor (that is embedded between the metal backing plate of the brake pad and the actual brake pad material) is triggered when it touches the brake rotor. This “Brake Pad Wear Sensor” has a small metal band this is designed to fail when the thickness of the brake pad material gets too close to the metal backing plate. Once this fails it will send a warning to your dash and will have to be replaced when the brake pads are replaced. I have found that, in general, once this REAL brake warning is tripped you likely have 1-3,000 miles before the brake material is gone and the metal backing starts acting as a brake pad which grinds into the rotor and causes permanent rotor damage and poor braking. In reality when you see that light, assume you have days to schedule a repair and not weeks or months. The longer you wait the more at risk you are for complete braking system failure and injury. First, it is very important to know that many retailers sell brake parts such as brake pads and rotors in a set of 2 which include the left AND right side for the front OR rear separately. You simply cannot buy a left OR a right side set of front or rear brake pads. You have to buy them in a ‘axle set’ which is the front left and right or the rear left and right. That is how they are packaged so you can’t make a mistake when shopping. While some retailers will LIST brake rotors separately you should always buy a matching set of left and right for the front or rear (both if you need to replace both at the same time). If you intend on switching brands or specifications of brake rotors or brake pads you should match the front and rear whenever possible. You do not have to replace front and rear brake pads and rotors at the same time, but must always replace left and right from the same axle at the same time. This is critical. Well, you’re in luck. OutMotoring.com has tons of options when it comes to replacing worn brake pads, rotors and other components. While we could get into a very lengthy performance brake upgrade discussion lets just introduce a few products to consider. OEM, OE, Aftermarket, Performance. Man, I’m confused. You can always replace the worn stock/OEM brake pads and rotors with the same exact part that are on your car already, but that may take some research if you are not the original owner or do not have accurate service records. Going with what the manufacturer designed for your car is a sound option. We offer a full selection of every factory installed brake pad and brake rotor that MINI specifies. It is very important to confirm your model as in most cases the base Cooper has different part numbers than the Cooper S. The JCW (John Cooper Works) models with the larger “Big Brakes” require specific part numbers too. Shop online at our website using our drop down menu to select your model and sub navigate to the “brakes” or the “replacement parts” section and then to the “brakes” subcategory. If you would like to consider using aftermarket brake pads and rotors we also have a great selection of brake kits (including pads and rotors) as well as pads and rotors sold a’ la carte. Check out these 2 great kits (linked below) as they offer a significant price savings over the factory OE (Original Equipment) parts while maintaining or increasing performance. The term ‘aftermarket’ includes any company or product that is anything BUT the exact part that MINI specifies for their vehicle. That will be a box with a part number from MINIs database/parts suppliers such as OutMotoring. In some cases that exact same part is sometimes sold through other channels, but with the name of the actual company that makes them for MINI. In this case it will be called a OEM (Original Equipment Manufacturer). It’s often very hard to find out who this company is, as MINI does not advertise “hey, you can buy the same thing from company x for ½ the price!” The next tier of product would be any product other than these 2 options and would be considered “aftermarket” as they are independent and not specified by MINI as a partner. There is often nothing wrong with using these aftermarket products as long as they are made to industry standards. As such we offer many options to suit your preference, budget or performance needs. As expected don’t sell brands or products that don’t match our strict standards. 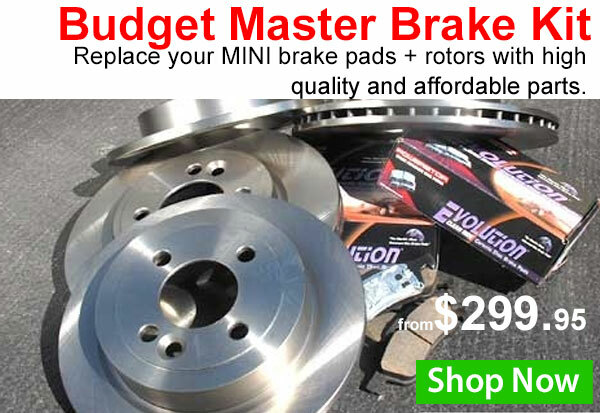 Our “Budget Master” budget is a great way to save money with factory equivalent brake rotors along with brake pads that offer a significant decrease in brake dust. I would have no issues using these on my personal MINIs and find the cost savings and ease of selection a major benefit. Plus, who doesn’t like saving money? Our ‘step up’ Stage 1 Brake Kit: Cross Drilled + Slotted offers brake rotors with slots and holes to help dissipate heat as well as brake pads that will reduce brake dust build up. This upgrade kit is still much cheaper than the factory issued brake pads and rotors and looks amazing thanks to the slot and hole pattern on the face of the rotor that can be seen through the spokes of your wheels. There are many other braking system options such as upgrading not only the brake rotors and pads but the brake calipers (front and or rear depending on the kit), and adding stainless steel brake lines. Larger rotors with increased surface area always help with braking performance, as do alternate performance oriented brake compounds, and larger, more effective brake calipers. Larger brake calipers with larger pistons (nested into the caliper) also create more force to clamp the brake pads to the rotor. These benefits are certainly worth considering as you shop for brake upgrades. There is more. Find out what the magic of a Big Brake Kit can do for your MINIs braking. Because these kits are engineered as ecosystem of parts the only way to get the benefit of using a larger caliper or rotor will be to buy a kit designed with matching rotors and calipers. Brake pads are also caliper specific so it’s best to just dive in and spend the big bux. Here is just a snapshot of what to consider from Brembo and Wilwood. We hope you enjoyed this basic introduction to fundamental braking components, basic diagnostics, common failures, brake component upgrades, and performance options. We intend this to be a introduction to braking components and we hope the info shared can help you, our customers, make informed decisions whenever new brakes are considered. Keeping you and your MINI safe is one of our number one concerns. When you have any questions or concerns about which brake related products to also consider as well as if a Big Brake Kit is the right option for you we’re here to help you. Comments on Have you checked your MINI brakes lately?